Total Drivin arrived at an apex in the evolution of the racing genre. The sun-drenched, checkpoint-chasers of yesteryear were hastily being consigned to nostalgia, as the advent of 3D saw a renewed push for speed and technical realism. By 1997, the transition was in motion, but the move towards a sim-dominated era would not be fully realised until Gran Turismo’s release the following year. As Namco’s superb Rage Racer showed though, concessions were already being made. Traditional arcade racers had started to incorporate elements of tuning and customisation, whilst shifting the emphasis towards racing opponents rather than the clock. The Need For Speed titles realised quickly the allure of brand marketing and attention to detail in winning over car fanatics, though in doing so, left comparatively little in the way of structured longevity, something else that was a burgeoning factor in racers of the time. Appropriately enough, arriving in the limbo period that it did, Total Drivin trumpets the accessible, colourful arcade ethos of the earliest Ridge Racer games, whilst venturing the weightier handling and challenging pack-racer mentality of TOCA. In doing so, it discovers an improbable happy medium. Whilst Eutechnyx’s first PlayStation venture never quite had the bells ‘n’ whistles to challenge the premier driving games of its generation, aficionados will remember Total Drivin as an example of appreciable craft; the leader of the chasing pack, if you will. TD showcased the credentials of a talented development house, a racer that offered quality across the board, and a no-nonsense approach that’s still easy to appreciate almost two decades down the road. Things appear a little no-frills at the outset, but Total Drivin’s lean, streamlined setup is ultimately to its advantage. Consisting substantially of single races, the game’s generous content is doled out via its six eclectic track locations (including Easter Island, Hong Kong and Scotland), the six increasingly tricky variants they each present, and the eight different constructors with whom you can compete with. To complete the game in its absolute entirety, you’ll need to best all 36 courses with each of the eight teams. To save you the arithmetic, that’s 288 races. Two hundred and eighty-eight races, provided you avoid any retries by winning every single one of them first time. Which you won't. ​Extended play reveals the fruits of Total Drivin’s ambition. The early races require smooth cornering and the ability to maintain speed through winding sequences, but as things progress, factors such as gradient change, blind crests, scenic hazards, and variable road surfaces all come into play. Add to this fog, pouring rain (and the understeer that results), a raft of punishing narrow paths between snow drifts and devilish, unpredictable A.I., and you’re in for a stern test. Total Drivin delivers an inviting blend of the realistic and the fantastical. It’s a concertedly challenging, borderline-punishing experience at times, but it doesn’t lose the joyous design spirit that typified racers before they began to suffocate on an endlessly recycled diet of real-world variants. Routes lead along highways with split paths; others venture across sand dunes before having you disappear into cavernous tunnels complete with lava flow for added pressure. Not only do the courses make for a diverse experience, there are a multitude of different vehicle classes to further test your driving acumen. These include rally and saloon cars, Dakar buggies and Indy Cars. They’re cohesive enough not to feel like a mish-mash of incompatible styles, though that being said, the Indy Cars are extremely unforgiving and in hindsight, perhaps a little too fast for the rally stage templates that characterise Total Drivin. You can’t help but admire a game with a nasty streak. Total Drivin seemingly had roguelike aspirations long before it was cool to entertain such notions. The computer opponents are hyper competitive, especially later on in the game, and to add considerably to the pressure, there's a rather unusual worry to factor in. In most racers, heading off course or crashing will see the player respawned to the track. But whilst clipping barriers is acceptable, sliding down a ravine, dropping into the lava flows or misjudging the urban ramps and ending up the wrong side of the barriers will see you greeted with an instant 'GAME OVER' message. 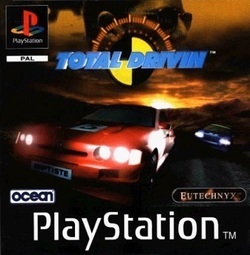 Sure, the menus and loading screens all look a bit formal and functional, but Total Drivin was still one of the more attractive racers on the market at the time. The cars in particular look great; vibrant, solid and especially resplendent in the game’s impressive replay sequences. The locales themselves are none-to-shabby either, with Moscow a notable standout, looking resplendent thanks to a surprisingly extensive imagining of Red Square. TD offers a robust though manageable difficulty curve that sees the player punished for sloppiness, and rewarded for sequences of good cornering. The A.I. is entertaining to say the least, operated by an innovative system that effectively means they share the same means of control as the player, so in effect they can’t ‘cheat’ their way through tricky obstacles or collisions. This makes for a curious experience at times, as opponents who remain so unerringly competitive in holding and maintaining large leads, tend to go to pieces when you eventually do reel them in. It’s easy to take your eye off the ball as rivals drive up rock faces, cause each other to spin out, and regularly hobble themselves on scenery. Comings-together, whether your own fault for a misjudgement, or the competitor’s for weaving in a stewards-baiting act of incompetence, rarely ends favourably for the player. So, though it’s mercifully free of damage parameters, a surprising amount of care and attention must be paid to overtaking. Rounding things off, there’s standard Time Trial and two-player options. The latter performs well, though is sadly (as was too often the case) entirely absent of computer opponents, and thus its appeal is marginalised. Total Drivin’s considerable selection of tracks and vehicle classes, as well as a good old-fashioned, straight-up challenge makes for an enjoyable experience that substitutes licences for imagination, and is all the better for it. Perhaps the only reason TD hasn’t been remembered more notably amongst the PlayStation’s history is that it lacks a humdinger feature, something that might truly have defined it. It was nevertheless a fine first attempt at 3D racing from Eutechnyx.